Stunning garden flat in a gracious Georgian terrace of town houses, within level walking distance of Bath city centre. Large living room with comfy sofas, open fire (gas coal effect) and dining area. Fully equipped kitchen. Romantic double bedroom with vaulted ceiling and concealed lighting, leads through open archway to dressing room with two single beds (suit children or close friends!) Characterful vaulted bathroom. Walled garden with patio and barbecue. Free parking outside, easy access to local shops, pubs, theatre and pleasant walks. About Bath: Bath is Britain’s only World Heritage City with Roman baths, glorious Georgian architecture and a myriad of fascinating shops, restaurants and bars. 'Must sees' include the Roman Baths, Assembly Rooms, Royal Crescent, Pump Room and Pulteney Bridge - the choice is yours. Grosvenor Place offers the rarety of unrestricted parking outside, easy access to city centre and a small walled garden. Local pubs and shops within five minutes walk, and the city centre is about 15 minutes level walk away either along London Road or via the Kennet and Avon Canal towpath. The exciting new Thermae Bath Spa opens in Spring, 2004, with the chance to bathe in thermal mineral waters and enjoy a range of therapeutic treatments in the first new spa to be built in the UK for at least 200 years! The city itself is a shoppers' paradise, with many interesting and unusual independent shops. There's also a vast array of restaurants and pubs to suit just about every taste and pocket. Within Reach: Further afield the choices for days out range from Bristol, with its exciting new hands-on interactive science centre and SS Great Britain, to the Cotswolds. The ancient sites of Stonehenge and Avebury are also close by, while Wells and Glastonbury continue the historic theme. The National Trust village of Lacock is also a short drive away - see if you can spot familiar scenes from the film version of Jane Austen's 'Pride and Prejudice' and the Harry Potter series, while Castle Combe is just one of the many delightful country villages on the doorstep. The area around Bath offers wonderful opportunities for walking - the Cotswolds Way starts and finishes at the abbey doors, and the surrounding hills and woods are criss-crossed with public footpaths, many offering spectacular views of the city below. For the less energetic, Bath makes an excellent centre from which to tour the Cotswolds, as well as the beautiful countryside of Somerset, Wiltshire and South Gloucestershire. What's On? : Bath hosts a whole string of festivals throughout the year. The International Music Festival runs from mid-May to early June, there's a wine festival in June, a real-ale fandago in October, and a Film Festival and Mozart Festival both in November. The Christmas lights run through the whole of December, and there's always a performance of Handel's Messiah in Bath Abbey on the first weekend in December. For useful websites for further information, please ask us. To keep up to date with what's happening day-by-day (do not hesitate to contact owner for further information or link). This is a characterful property with a lovely homely feel. Has a small walled garden, which is a sun trap during the summer. Characterful spacious modern bathroom has a bath with overhead shower, sink and toilet. Gas central heating with combi boiler supplying constant hot water. Clothes airer provided and washing line and pegs for sunny days in the garden. Tea, coffee, sugar salt and pepper, washing up liquid and toilet rolls are all provided. Lovely sunny small walled garden with table and chairs and a bench. Washing line. Please note that there are stairs leading down to the apartment. 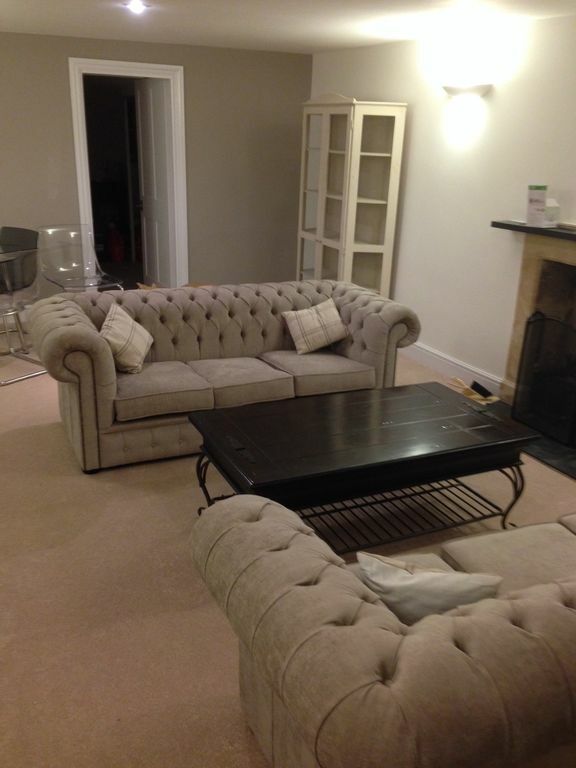 A good sized ground floor apartment that is a 15 minute walk into the centre of bath. Very clean and fully stocked with all you need ( towels, shower gel , kitchen stuff). Sue met us and was helpful and friendly and had left a few treats out for us. As we stayed over Christmas the flat was decorated with a few Christmas touches which was nice. We were pleased with the little village 4 minutes walk away and we used the deli and the burger takeaway as well as the two convenience shops. There is also a Morrison’s supermarket 5 minutes away. For location it was perfect. Just a few things that stopped me leaving 5 stars. The flat upstairs were noisy with footfall during the evenings. And the fire didn’t work which would have been nice over Christmas. Location good, apt. clean, comfortable and welcome when arrived. TV could be better situated. Stayed for 3 nights. Could have stayed longer. Would like to stay in summer to do the canal walk and enjoy the little garden. We walked from the Weir to the Crescent and unfortunately weather was not kind. Abbey also worth a visit. Christmas market was interesting and varied. A really good short break but could have done more if the weather was kinder and we had more time. Lovely dog friendly flat. Had a very relaxing visit would highly recommend. We will definitely be back again. Thank you Kimberley for taking the time to write a review. I'm really glad you enjoyed your stay and thank you for looking after the place. Beautifully renovated and huge for the price you pay. Sue was amazing at showing us our suite and how to get to Bath along with all the shops, food and pubs in the area. Meeting in person with Sue was great as she makes the transaction into the rental smooth. The only thing that was of mild concern was the fact that it is a 25 minute walk to and from Bath. But there is a bus stop near the suite, which takes you directly into the town centre. Overall, a great place to stay and Sue was phenomenal in getting guests settled in. Many thanks Ritchie and Laura for your lovely review. Bath is situated in the heart of England's beautiful West Country at the southern end of the Cotswolds Area of Outstanding Natural Beauty. The city is approximately 1.5 hours from London by rail (2 hrs by M4 motorway). Christmas and New Year weeks are charged at £440. Normal change-over day is Saturday, but other days will always be accommodated whenever possible - particularly in the less busy periods when short breaks are also available. Please contact us for prices for two, three and four-night stays.